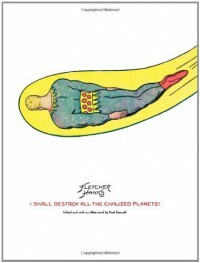 I think Robert Crumb says it best: "Fletcher Hanks was a twisted dude." This stuff is absolutely amazing. While Fletcher Hanks only did comics from 1939-1941 and wrote pretty standard super-hero type storylines, they are of such bizarro quality that I'm mesmerized by the sheer weirdness of it all. Stardust, the scientific marvel whose vast knowledge of all planets has made him the most remarkable person ever known, is devoting his abilities to crime-busting. Fantomah, the most remarkable woman ever known, has such keen insight that she can see and know all that happens in the jungle. She devotes her strange powers to protecting the creatures of Jungleland. But as far as powers go, they sort of just have whatever amazing power pops into Hanks' head at the time, it seems, like turning people into rats or icicles, or growing and shrinking rays. What really impresses me, though, are the ways they mete out their punishments. Stardust reduces a villain to just a head, picks it up and throws it into space! Fantomah transforms a pair of thieves into lizard-like freaks and sends them back home to live as outcasts! ("You have defiled the jungle's sacred city, so you shall fly back to your own land as objects of disgrace!" As they fly back home they lament, "Crime doesn't seem to pay!"). These aren't typical punishments. They are almost biblical, as if dealt from a wrathful Old Testament God. My oxygen-destroying ray is perfected, and we're ready to make the set-up for its use! We'll distribute the ray in an inactive state, and then I'll release the ray action by radio control from a central point! Every big shot in America is to die by suffocation, all at the same time! When they're out of the way, we grab control of everything! See? This stuff is nuts. Funny thing is, even though these read like superhero parodies, they are not. Nor are they sincere but awkward attempts at serious stories, a la Ed Wood. No, I think Fletcher Hanks, being a drunk and abusive husband and father, was just trying to churn out stories to earn money for his next bottle of hooch. In doing so he let his id run wild and we get a glimpse of a mind whose rage and self-loathing manifest through bizarre stories of catastrophic plots foiled by godlike heroes. Or maybe not. Maybe I'm reading too much into it. Whatever the case, these stories are a hoot. Paul Karasik has done a service to comics fans for assembling them here.